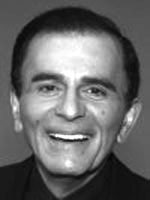 Casey Kasem was the voice of the American Top 40 radio music program. He was also the original voice of Shaggy from the Sat Morning cartoon Scooby Doo. 10/14/1974 0160 A Scaffold for Two After his plane crashes in a secluded island, a lawyer learns that the locals employ their own judicial code. He is forced to take part in their farce of a system that ignores legal conventions. 09/12/1975 0343 The Ghost Plane A pair of strangers awaken aboard a strange plane with absolutely no recollection of who they are, and what they are doing there. Along the way, the pick-up three other passengers who suffer from the same memory loss as they travel towards a mysterious destination. 09/23/1975 0349 The Headless Hessian On the eve of their battle at Trenton, George Washington's troops are spooked and later assisted by a decapitated ghost. +RIP Mr. Kasem. The voice of my growing up years. Thanks for the memories. I grew up listening to Casey Kasem on American Top 40, which made its mark during the 1970s -- the second "golden age of radio." He was, as TIME magazine reported today, "America's voice." R.I.P. Kasem's acting in all three episodes is excellent. I will admit that when I imagine Kasem's character, Conrad, in "A Scaffold for Two," I imagine Shaggy from Scooby-Doo.